This article is about the men's team. For the women's team, see Bangladesh women's national cricket team. The Bangladesh national cricket team (Bengali: বাংলাদেশ জাতীয় ক্রিকেট দল), is administered by the Bangladesh Cricket Board (BCB). Bangladesh is a full member of the International Cricket Council (ICC) with Test and One Day International (ODI) status. It played its first Test match in November 2000 against India in Dhaka, becoming the tenth Test-playing nation. Bangladesh's first official foray into international cricket came in the 1979 ICC Trophy in England. On 31 March 1986, Bangladesh played its first ODI match, against Pakistan in the Asia Cup. For a long time, football was the most popular sport in Bangladesh, but cricket gradually became very popular – particularly in urban areas – and by the late 1990s had surpassed football. Bangladesh made its full debut in international cricket in the 1986 Asia Cup. In 1997, Bangladesh won the ICC Trophy in Malaysia and thus qualified for its first Cricket World Cup to participate in England in 1999. There, it defeated Pakistan – causing much upset – and also Scotland. 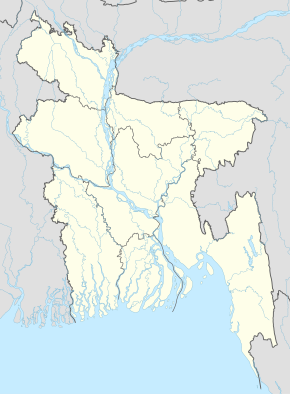 On 26 June 2000, Bangladesh was granted full ICC membership. Bangladesh holds the record for most consecutive losses in Tests (21, between 2000 and 2002) and ODIs (23, between 2001 and 2004). After gaining full member status with the ICC, Bangladesh had to wait until 2004 for its first ODI win since the 1999 World Cup. The team on the losing side on that occasion was Zimbabwe, who also participated in Bangladesh's maiden Test victory in 2005; by securing a draw in the second match, Bangladesh won their first Test series. In 2009 Bangladesh toured the West Indies for two Tests and by winning both secured their first overseas Test series victory. As of 28 July 2018, Bangladesh has played 108 Tests, winning ten. Its first victory was against team Zimbabwe, and the next two came against the West Indian team. Results have improved predominantly at home with draws earned against New Zealand, Pakistan, India and South Africa and wins against England, Sri Lanka and Australia. They played their 100th Test when they toured Sri Lanka in March 2017. The team has been more successful in ODIs, having won 118 of its 353 matches. It has also played 82 Twenty20 Internationals, winning 26. Bangladesh is currently ranked ninth in Tests, seventh in ODIs and tenth in T20Is by the ICC. Captained by Gazi Ashraf, Bangladesh were dismissed for 94 and Pakistan reached their target for victory with seven wickets in hand. They lost their second ODI, which was against Sri Lanka, finishing last in the three-team tournament. Bangladesh qualified for the 1988 Asia Cup, this time hosting the tournament; it was the first time ODIs had been staged in the country. Although they lost all their matches, Bangladesh's fixtures were retrospectively awarded ODI. Floods in the preceding months meant the tournament was in doubt, but it went ahead as planned. A charity match raised $70,000 for the flood victims. Bangladesh added a black mark in 1986 ICC Trophy with only 2 wins. Bangladesh took part in the 1990 Austral-Asia Cup, the Asia Cup in 1990–91, 1995, 1997, and several other triangular tournaments, but it was not until 1998 that they won their first ODI. Their 22-match losing streak since their first ODI was at the time a record. Bangladesh posted its first ODI win against Kenya, in India thanks largely to Mohammad Rafique, who contributed a fiery 77 runs and took 3 wickets. Put on 137 for the first wicket with Athar Ali Khan. Athar's own contribution was 47. In October 1998, Bangladesh hosted (but did not participate in) the first ICC KnockOut Trophy ever held (the event later became the ICC Champions Trophy), a knock-out ODI tournament featuring all the Test playing nations. Bangladesh took part in each of the 1979, 1982, 1986, 1990, and 1994 editions of the ICC Trophy, and won the trophy in 1997, in the process qualified for the 1999 World Cup. The then General Secretary of Bangladesh Cricket Board, Aminul Huq Moni took the initiative to install Astro Turf in Abahani Cricket Ground and Bangabandhu National Stadium, so that the local players had two full seasons to prepare on the type of pitch they would playing in ICC Trophy in 1997. Bangladesh also became a regular ICC member with the right to play ODIs and started hosting bilateral and triangular ODI tournaments. Earlier, in February Dhaka hosted the third and final SAARC cricket tournament. Bangladesh played in its first World Cup in England in 1999 and recorded their first win in a World Cup match against Scotland. Later Bangladesh created an enormous upset by beating Pakistan by 62 runs in the group match at Northampton. Bangladesh made 9/223 from its full 50 overs, and in reply, Pakistan could only manage 161 due to timely run-outs by wicket-keeper Khaled Mashud and some tight bowling by Khaled Mahmud, who took 3/31 from 10 overs. Mahmud was judged the man of the match. Bangladesh did not qualify for the Super Six round due to defeats in three of its five matches. However, the win over Pakistan, who finished runners-up to Australia, helped Bangladesh to gain Test playing status the following year. Bangladesh had sacked coach Gordon Greenidge, who had steered the team through the 1997 ICC Trophy and into the 1999 World Cup on the morning of the match. Former South Africa Test cricketer Eddie Barlow became Bangladesh's coach in 1999. In preparation for becoming a Test playing country, Bangladesh established its own first-class competition in 1999—2000, although the matches were not given first-class status until the 2000—2001 season. The lack of an established first-class structure in the country until shortly before Bangladesh played its debut Test has been cited as one of the reasons the side struggled to adapt to the longer format of the game. The West Indies toured Bangladesh in October, winning both matches in the ODI series. After suffering a stroke in April 2000, Barlow vacated the position of coach and Sarwar Imran was handed the coaching job. In May and June 2000, Bangladesh hosted the Asia Cup; Bangladesh lost all three of their matches and when playing Pakistan succumbed to what at the time was the heaviest defeat in ODIs, a margin of 233 runs. Bangladesh participated in the 2000 ICC KnockOut Trophy in October; their only match ended in defeat by England. On 13 November 2000, Bangladesh played their inaugural Test match, hosting India in Dhaka. The first Test run in the history of Bangladesh Cricket came from the bat of Mehrab Hossain, who also scored the first ODI hundred by an individual player for Bangladesh in 1999. Captained by Naimur Rahman, Bangladesh lost by nine wickets, although Wisden noted that they "surpassed all expectations by matching their neighbours, and at times even enjoying the upper hand". Aminul Islam Bulbul scored 145 in the first innings, becoming the third person to have scored a century in their team's first Test; Rahman took six wickets for 132 runs, the second-best bowling figures in a country's maiden Test. In March 2001, former Australian Test cricketer Trevor Chappell was appointed coach. The following month Bangladesh embarked on a tour of Zimbabwe to play two Tests and three ODIs. Zimbabwe, who at the time were ranked ninth out of the ten Test teams, won all five matches. Bangladesh took part in the 2001–02 Asian Test Championship, the second and final time the championship was held and the first the team had been eligible to play in. They lost both their matches by an innings. Mohammad Ashraful made his debut in the series and became the youngest player to score a Test century in his first match. In November, Bangladesh hosted Zimbabwe for two Tests and three ODIs. The opening Test was curtailed by bad weather and ended in a draw; after losing their first five Tests, it was the first time Bangladesh had avoided defeat. Zimbabwe won all the remaining matches. After the Test series wicketkeeper Khaled Mashud replaced Rahman as captain. The following month Bangladesh journeyed to New Zealand for two Test matches. Bangladesh's batsmen struggled in unfamiliar conditions and the team slumped to two innings defeats. In January 2002 Bangladesh lost two Tests and three ODIs at home against Pakistan. At this point, they had lost ten of their first eleven Tests; only South Africa had struggled as much in their introduction to Test cricket, also losing ten of their first eleven matches. Chappell blamed Bangladesh's batsmen for the loss, saying "they commit the same mistakes again and again, and need to learn to apply themselves, to bat in sessions". In April, former Pakistan Test cricketer Mohsin Kamal replaced Chappell as coach. When Bangladesh toured Sri Lanka in July and August they were on the receiving end of Sri Lanka's largest margin of victory in Test cricket: an innings and 196 runs. Bangladesh lost both Tests and all three ODIs on the tour, recording their 50th defeat in 53 ODIs. Repeated poor performances prompted people to question whether Bangladesh had been granted Test status too soon. Two defeats against Australia and New Zealand in pool matches knocked Bangladesh out of the 2002 ICC Champions Trophy. Test and ODI whitewashes followed in South Africa in October. Wisden noted that "Time and again ... came the mantra that [Bangladesh] would learn from the experience, that they could only improve by playing against the best, that there was genuine talent in the squad. But it wore thin." The final defeat set a record for most consecutive losses in ODIs (23), beating the previous record, which was also held by Bangladesh. When the West Indies toured in November and December, Bangladesh lost both Test and two out of the three ODIs, and one ended in no result. Bangladesh hit several new lows on the third day of the first Test: their lowest innings total (87), their lowest match aggregate (226), and the biggest defeat in their 16 Tests (by an innings and 310 runs). South Africa hosted the 2003 World Cup in February and March. Bangladesh lost five of their six matches (one ended in no result), including fixtures against Canada, who hadn't played international cricket since the 1979 World Cup, and Kenya, who eventually made the semi-finals of the tournament. In the aftermath of Bangladesh's World Cup campaign, Habibul Bashar replaced Khaled Mashud as captain, and Kamal was sacked as coach with Dav Whatmore taking over the role. Whatmore was not able to begin the job immediately, so Sarwar Imran acted as interim coach during TVS Cup and South Africa's tour of Bangladesh in April and May. Bangladesh lost all four ODIs by large margins and two Tests by innings. Bangladesh played 7 more Tests and 11 more ODIs in 2003 against Australia, Pakistan and England, losing every single match. However, in September, Bangladesh came very close to its first Test victory, when it lost to Pakistan by only one wicket. It was just the tenth time in Test history that a team had lost by a single wicket. In series against Pakistan, Alok Kapali became the first Bangladesh player to take a hat-trick in Test cricket, dismissing Shabbir Ahmed, Danish Kaneria, and Umar Gul. When England toured Bangladesh October and November, Bangladesh's captain, Mahmud, was booed. Ahead of Bangladesh's tour of Zimbabwe in February and March the next year, he was dropped from the squad and batsman Habibul Bashar was granted the captaincy. At the time, Zimbabwe were without many of their senior players. Bangladesh lost the Test series 1–0, and the ODI series 2–1. The second Test was drawn after 3 days of no play due to heavy rains and brought an end to their run of 21 consecutive defeats dating back to November 2001, a world record in Test cricket. The solitary ODI victory was Bangladesh's first international win since defeating Pakistan in the 1999 World Cup. Bangladesh's next matches were against the West Indies in May and June. Bangladesh lost the ODI series 3–0 and the Test series 1–0; by securing a hard-fought draw in the first match, Bangladesh managed to avoid defeat for just the third time in 29 Tests. Bangladesh participated 2004 Asia Cup and 2004 ICC Champions Trophy winning only one match against Hong Kong. In the following months, Bangladesh suffered heavy defeats in Tests and in ODIs against touring New Zealand and India. However, in December, Bangladesh defeated India in its hundredth ODI, this being only the third time that it had won against a Test playing nation. In January 2005, Zimbabwe toured Bangladesh for two Tests and five ODIs. The touring Zimbabwe side had suffered due to player disputes which in 2004 had led to the country's temporary suspension from Test cricket. Of Zimbabwe's 16-man squad, only their captain had played more than nine Tests; Bangladesh was the more experienced team. In the first match, Bangladesh secured their maiden victory in Test cricket. Bangladesh's batsmen secured a draw in the second Test by batting out the final five session after coach Dav Whatmore had opined that "Zimbabwe will win, unless our batsmen do something special". First Test win ever for Bangladesh. In the match – which helped secure a historic first series victory for Bangladesh – Enamul Haque Jr broke his own bowling record for best figures in an innings for Bangladesh by taking 7 wickets for 95 runs, and secured the best figures in a match for Bangladesh: 12 wickets for 200 runs and captain Habibul Bashar hit half centuries in both innings. In the ODI series that followed, Zimbabwe won the opening two contests, and Bangladesh won the final three to take the ODI series. After their maiden Test victory, Bangladesh embarked on its first tour of England in May and June 2005. The team faced unfamiliar conditions and the batsmen struggled against seam bowling. Bangladesh lost both matches in the Test series by an innings; the second Test was the 22nd time it had happened in 38 Tests. Pundits Mike Atherton and Richie Benaud criticised the team's performances and suggested Bangladesh was not yet suited to Test cricket. A triangular series with England and Australia followed. Bangladesh won just one match out of six, but their solitary victory was against an Australian side that at the time were world champions in what Wisden described as "the biggest upset in one-day international history". First odi win by Bangladesh against Australia. Mohammad Ashraful scored his first century in that match with a score of exactly 100, which was enough to take the team to victory and then played a blistering knock of 94 off 53 balls against England the following match. Bangladesh's next fixture was in Sri Lanka in September for two Tests and three ODIs. After the one-off victory against Australia in England, Bangladesh was a more confident team; however, Sri Lanka won all five matches by large margins. Captain Habibul Bashar lamented his side's defeat, describing it as "the worst tour since I took over the captaincy". The home season of 2006 began with some optimism for Bangladesh, which registered its first win against Sri Lanka ever in the second match of the ODI series. However Bangladesh lost both ODI and Test series 2–1 and 2–0 respectively. At the end of March, Bangladesh played four ODIs against Kenya, winning all. Then in April, Bangladesh came very close to beating Australia in a Test match, taking a first-innings lead of 158, and eventually losing by only three wickets. Bangladesh lost the second Test by an innings and three ODIs by huge margins. At the end of July, Bangladesh toured Zimbabwe as the ODI series as favourites but lost 3–2. In August, the team defeated Kenya in all three matches of a series. India hosted the 2006 ICC Champions Trophy in October and November. Bangladesh failed to progress beyond the group stages, losing two of their three matches. Their only victory came against Zimbabwe. Bangladesh won their inaugural T20I match against Zimbabwe in front of the home crowd and subsequently went on to whitewash the same opponent in the five match ODI series. Bangladesh capped year 2006 with two more ODI victories over Scotland. That year, Shahriar Nafees became the first Bangladeshi to score over a thousand runs (which included three centuries) in a calendar year, while Mashrafe Mortaza became the leading wicket-taker in the world in ODIs staged in 2006 with 49 wickets. Ahead of the World Cup Bangladesh faced Zimbabwe in four ODIs, and Bermuda and Canada one each; of those matches, Bangladesh lost a single ODI to Zimbabwe. Australia, Bangladesh, India and Pakistan were the only teams to win both of their warm-up games. On 17 March, in their first match of the 2007 World Cup, hosted by the West Indies, Bangladesh secured a five-wicket win over India; the surprise result triggered late night partying in Bangladesh despite government bans on public gatherings. In their remaining group matches Bangladesh lost to Sri Lanka and defeated Bermuda, which was enough to secure qualification for the second round while India was knocked out. Bangladesh's only victory in the Super Eights was against South Africa, losing to everyone else including Ireland, a team mostly made up of amateur cricketers. In April 2007, after four years as coach Whatmore chose not to extend his contract, but agreed to remain in charge until the end of May, to allow the BCB to find and appoint his successor and also to guide the side through the two Tests and three ODIs at home against India. After Bangladesh had helped knock India out of the tournament, the series was seen as an opportunity for India to exact revenge. India won the three match ODI series 2–0, one being washed out. Bangladesh had not played Test cricket since April 2006. The first Test was shortened due to rain and drawn, but India won the second by their largest margin ever (by an innings and 239 runs). In the aftermath Habibul Bashar, who had previously resigned as ODI captain, was replaced as captain by 22-year-old Mohammad Ashraful in all forms of the game. Mashrafe Mortaza was appointed vice-captain. BCB appointed their Under-19 coach Shaun Williams as the Bangladesh's interim coach, until they find Whatmore's long term successor. Ashraful's first series in charge was a tour of Sri Lanka in June and July. Bangladesh suffered heavy defeats in each of the three Tests; losing by an innings on every occasion, and three ODIs. In the first innings of the second Test, Bangladesh was bundled out for their lowest total (62). Prior to the World T20, Bangladesh played two T20Is in Kenya. Here, they enjoyed victory over Kenya, but lost to Pakistan. South Africa hosted the 2007 ICC World Twenty20 in September. Bangladesh defeated the West Indies at the group stage to progress to the Super 8 stage of the tournament. However, it was the only match they won in the tournament, losing next four matches. During the Super 8 match against Bangladesh, Australian fast bowler Brett Lee took the first Twenty20 International (T20I) hat-trick ever achieved. In late October, BCB appointed Jamie Siddons, an Australian cricketer, as their head coach. Towards the end of 2007, Bangladesh toured New Zealand. They were soundly beaten 3–0 in the one-dayers. Bangladesh started the new year with the Test leg of the tour. These matches were also one-sided, where Bangladesh lost the series 2–0. Bangladesh lost both first-round games against Pakistan and India at a triangular ODI tournament held in Bangladesh in June. At the 2008 Asia Cup held in Pakistan, Bangladesh won their first group stage game against associate UAE. Even though they lost to Sri Lanka in the next group stage match, Bangladesh reached the super four stage, before losing the next three games against India, Sri Lanka and Pakistan. They were later got whitewashed 0–3 in the ODIs during their tour to Australia in August–September. In October, New Zealand toured Bangladesh for three ODIs and two Tests. Shortly before the tour, fourteen Bangladesh players left to play in the Indian Cricket League and were subsequently banned for ten years. Six of the players were centrally contracted, including former captain Habibul Bashar. With a less experienced team than usual and a poor record against New Zealand, Bangladesh was expected to lose heavily. After winning the opening ODI (their first ODI victory ever over New Zealand), Bangladesh went on to lose series 2–1. New Zealand won the first Test by three wickets in what their coach, John Bracewell, described as "one of the great character wins". The second Test ended up in a rain curtailed draw, sealing the series victory for New Zealand (1–0). But in the process Shakib Al Hasan emerged as an all-rounder. Having previously been selected primarily as a batsman, he went on to take the best bowling figures in an innings for a Bangladesh player, 7 wickets for 36 runs, beating the record set by Enamul Haque Jr three years earlier. In November, Bangladesh toured South Africa. They lost all their matches to South Africa, including the only T20I match, two of the three ODIs (the third being washed out due to rain) and both Tests by innings. In December, however, Bangladesh bounced back from the previous lackluster performances by threatening to win the first Test match against Sri Lanka at home by chasing down the highest fourth innings total of 513. Though they fell 107 runs short, their performances were praised. But in the second test match of this home series in January, Bangladesh succumbed to a 465 runs defeat, conceding the series 2–0 to Sri Lanka. Then Zimbabwe joined the hosts and the Lankan team for a tri-series ODI tournament, which proved to be more evenly matched than was expected. In the first match, Zimbabwe defeated Bangladesh by an excellent performance, but then was defeated by Sri Lanka by a huge margin, leaving Bangladesh needing to win with a bonus point against the Lankans in the last group match to go through to the finals to join the Lankans. In a reduced match due to rain interruptions Bangladesh recorded their second ODI win over Sri Lanka to reach the finals. However at the Finals, they were beaten by the Lankans who claimed the Series. Later in the same month the three match ODI series against Zimbabwe at home was won by Bangladesh 2–1. At the 2009 ICC World Twenty20 held in England, Bangladesh crashed out of the tournament at the group stage after losing both games against India and associate Ireland. Aftermath of the losses at the global event, the selectors appointed Mashrafe Mortaza as the new captain of the team for the tour to the West Indies so that Ashraful could focus on his batting. The two Test series was played amidst controversy when a pay dispute between the West Indian players and the West Indies Cricket Board led a number of West Indian players boycotting the series, which forced the West Indies to select a number of inexperienced players as replacements. Bangladesh went on to win both of the Tests, winning the first Test by 95 runs and the second by four wickets. In the process they achieved their first overseas Test series victory. In the ODI series which followed, Bangladesh secured their first ODI win against the West Indies at the 14th attempt. Bangladesh won the series 3–0, but lost the only Twenty20 match. Bangladesh emerged victorious 4–1 and 4–1 in back to back five match ODI series against Zimbabwe away (in August) and home (in October–November). In November, Shakib was named The Wisden Cricketer's "Test Player of the Year". Shakib Al Hasan captained Bangladesh during their historic Test series win against West Indies in 2009. In January 2010, Bangladesh hosted a tri-series ODI tournament with India and Sri Lanka. They failed to win a match (in 4 matches) and went out of the tournament. That was followed by a two-match Test series against India at home, which Bangladesh lost 2–0. During full away tour in February 2010 against New Zealand, Bangladesh lost all matches (only T20I, three ODIs and only Test). In February–March 2010, England visited Bangladesh to play three ODIs and two Test matches. Bangladesh lost all their ODIs and Tests in the series. In May, Bangladesh took part in the 2010 World Twenty20. They lost all their matches at group stage (against Pakistan and Australia) and failed to progress to the Super Eights stage. In May and June, Bangladesh played two Test matches against England away, losing both, although Tamim Iqbal scored two centuries in the series. Between the Tests and ODIs against England, Bangladesh took part in the 2010 Asia Cup during June, but lost all their matches vs India, Sri Lanka and Pakistan. In the ODI series, England comfortably won the first match. However, in the second match at Bristol, Bangladesh beat England for the first time in international cricket (England were the only Test playing nation yet to be beaten by Bangladesh), bowling England out in the final over to win by five runs. However England won the third ODI at Birmingham and sealed the series 2–1. Bangladesh extended this tour in Europe to play 2 match ODIs series against Ireland. The series was shared (1–1). The one-off ODI against Scotland was abandoned due to heavy rains. Later Netherlands won the last one-off ODI of the tour. In October New Zealand went to Bangladesh for five ODIs. 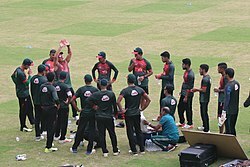 Mortaza suffered an injury in the first match and Shakib took over as captain. Under his leadership Bangladesh won the series 4–0 (2nd ODI was abandoned due to rain), securing their first series victory against a full strength ICC Full Member nation. Although unable to play against New Zealand due to injury, while the series was in progress Tamim Iqbal was named The Wisden Cricketer's "Test Player of the Year". In December Bangladesh hosted Zimbabwe for five ODIs. After losing the opening match, Bangladesh went on to win the next three complete matches, with 4th ODI called off due to rain, to beat Zimbabwe 3–1. In February and March 2011, Bangladesh co-hosted the World Cup with India and Sri Lanka. Bangladesh lost the tournament opener against India, before the win against Ireland. The next match was won by West Indies after dismissing Bangladesh for 58 runs, the team's lowest score in ODIs and a record low for a Full Member at the World Cup. The West Indies and Bangladesh team buses were stoned as they left the ground, and so was Shakib's house. Bangladesh later defeated England, and the Netherlands, making their final match of the group stage a must-win contest. Against South Africa, Bangladesh succumbed to their second-largest defeat in ODIs and became the first Full Member team to be bowled out for under 100 twice in World Cups, thereby failing to progress to the knockout stage of the tournament. Then Australia complete a 3–0 sweep in ODIs against Bangladesh when they visited the country in April. Middle of the Australian visit, BCB confirmed that Siddons unlikely to win a contract extension from the moment his team failed to meet lofty home expectations during the 2011 World Cup. Under his mentorship, Bangladesh won 2 Tests (in 19), 31 ODIs (in 84). They did not win any T20Is (in 8) during this period. First overseas Test series victory, first Test match and series victories over West Indies, first ODI wins against New Zealand, West Indies and England, clean sweeps in ODIs against West Indies (away) and New Zealand (home), reaching the final of a triangular tournament where all participants are ICC full members, consistent wins in bilateral ODI series against Zimbabwe (4) were the highlights for Siddons as the Bangladesh head coach. During his three-and-a-half-year tenure as coach Siddons introduced a full coaching staff for the first time, including coaches for bowling, strength and conditioning, and fielding. Under Siddons Bangladesh's reliance on spin bowlers continued, partly because pitches in the country encourage spin bowlers, and frequently only two seam bowlers were used in a match. Siddons was credited with helping the team improve mentally. A lengthy hunt for a head coach, followed Siddons' exit encountering the names of Vincent Barnes and Stuart Law as possible appointees. Law, who at the time was the interim head coach of Sri Lanka following Trevor Bayliss' departure, was named Bangladesh's new head coach starting from 1 July 2011. Bangladesh toured Zimbabwe in August 2011 for a one-off Test and five ODIs. The Test marked Zimbabwe's return to the longest-format of the game, after a self-imposed withdrawal in January 2006 as the sport in the country was in a state of disarray. Bangladesh lost the match by 130 runs. Though they were expected to do well with the Test and the ODIs, Bangladesh lost the subsequent one-day series 3–2. In the aftermath of the series, captain Shakib Al Hasan and vice captain Tamim Iqbal were sacked from their leadership roles, with a BCB representative citing their poor leadership. Later that month, wicket-keeper Mushfiqur Rahim was named captain, with all-rounder Mahmudullah as his deputy. Bangladesh' struggles at international level have been epitomised by the ineffectiveness of their fast bowlers. Between January 2010 and August 2011, they took 37 wickets in 8 Tests at an average of 67.67, the worst out of the nine teams playing regular Test cricket in this period. Though Bangladesh won Rahim's first match in charge, the only T20I against West Indies at home in October, the team lost the subsequent ODI series 2–1 and the two-match Test series 1–0. Pakistan toured in December, and during the first of three ODIs Bangladesh were dismissed for their 13th score of less than 100 in the format, overtaking Zimbabwe's record of 12 times. Bangladesh got whitewashed comprehensively across formats, 0–1 (T20I), 0–3 (ODIs) and 0–2 (Tests). In March Bangladesh hosted in the 2012 Asia Cup featuring India, Pakistan, and Sri Lanka. Bangladesh entered the tournament with just two wins from 29 Asia Cup matches. Victories against India and Sri Lanka saw Bangladesh face Pakistan in the final, only the second time the team had reached the final of a multi-national competition. Though Pakistan won the final by two runs, Bangladesh had exceeded expectations. During the tournament, Tamim Iqbal became the first Bangladeshi player to score four consecutive fifties in ODIs. Shakib Al Hasan was named man of the series after contributing with both the bat and the ball, making 237 runs and taking 6 wickets respectively. The following month Law announced he would be stepping down as coach in June when his contract was due to expire for personal reasons. Bangladesh had not won any Tests (in 5) under Law. Further they only won 5 ODIs (in 15) and 1 T20I (in 2) during this period. Reaching the finals of Asia Cup 2012 was the pinnacle of Law's tenure as Bangladesh coach. In May 2012 Bangladesh have appointed England born Richard Pybus as their new head coach for two-years, replacing Stuart Law who stepped down from the post in April. During Bangladesh tour of Ireland and Netherlands in July, they clean swept the three match T20I series against Ireland, lost a T20I against Scotland and shared the two match T20I series against Netherlands 1–1. Bangladesh crashed out of the 2012 ICC World Twenty20 by losing to New Zealand and Pakistan in the first round. After only four months at the helm, Pybus notified the BCB of his unwillingness to continue due to issues with his contract and interference from administration. Under him Bangladesh won 4 T20Is (in 8). The team's bowling coach and Australian Shane Jurgensen was appointed as the interim Bangladesh coach for the series against West Indies at home in November–December 2012. The home side lost the two Tests, but won the ODI series 3–2, before losing the only T20I. In February 2013, BCB announced that Jurgensen will continue as Bangladesh's head coach for the rest of the year. Bangladesh toured Sri Lanka in March 2013 for a full series. In the 1st Test at Galle Mushfiqur Rahim scored the first double century for Bangladesh in test cricket, and Mohammad Ashraful chipped in with a handy 190. They were able to draw the 1st Test against Sri Lanka, the first time ever against the island nation. Sri Lanka won the 2nd Test by 7 wickets and the two match test series 1–0. The three match ODI series was shared 1–1 since the 2nd ODI being washed out. Bangladesh lost the only T20I too. Then they toured Zimbabwe from April–May. Bangladesh lost the 1st Test by 335 runs, which marked the Zimbabwe's biggest win. Later they won the 2nd Test by 173 runs to share the series with Zimbabwe (1–1). Bangladesh lost the ODI series (1–2) before sharing the T20I series (1–1). Later in October–November 2013 Bangladesh achieved a new feat sharing the two match test series (0–0) on home soil against New Zealand, the first against the country. This was followed by 3–0 series whitewash win for Bangladesh in ODIs, before losing the only T20I. Sri Lanka toured Bangladesh for full series from January–February 2014. Bangladesh slip to their fourth-heaviest defeat in their Test history after losing the 1st Test by an innings and 248 runs. The 2nd test was a high scoring draw and Bangladesh lost the series (0–1). Later they got whitewashed in the T20I (0–2) and the ODI (0–3) series. That was followed up by a series of defeats (0–4) against Asian Cricketing nations (India, Afghanistan, Pakistan, Sri Lanka) at the league stage of 2014 Asia Cup conducted on their home soil and Bangladesh finished at the bottom of the table. Associate Afghanistan's win against Bangladesh was their first ODI victory against a Test-playing nation. Bangladesh ended their 11 match win-less run in 2014 defeating two associates (Afghanistan and Nepal) in consecutive T20Is at the 2014 ICC World Twenty20 Group stage. Their loss to another associate, Hong Kong, did not prevent them reaching the Super 10 stage. However at the Super 10 stage, Bangladesh lost all (0–4) their matches against West Indies, India, Pakistan and Australia. The coach resigned from his position less than a month after the World T20, where the team won just two out of seven matches. Under Jurgensen, Bangladesh won 1 Test (in 10), 8 ODIs (in 21) and 3 T20Is (in 14). Highlights of his tenure were the Test win after 4 years (against Zimbabwe), shared two-test series against New Zealand at home, 3–0 ODI clean sweep against New Zealand at home and securing 2 draws in Tests against Sri Lanka (away and home). The BCB appointed Chandika Hathurusingha, a former Sri Lanka batsman, as Bangladesh's head coach for a two-year period. The first series under the new coach was against India at home. Bangladesh lost the first & second ODI comprehensively and the 3rd was washed out and lost the series 2–0. Bangladesh toured West Indies for a full series in August. West Indies beat Bangladesh 3–0 in the ODI series extending Bangladesh's win-less ODI run for 13 matches. In the 2nd ODI Bangladesh was bundled out for 70 which is the 3rd lowest total for Bangladesh. Bangladesh lost the match by 177 Runs. Only the T20I match was abandoned. Further, West Indies white-washed Bangladesh in the Test series 2–0, defeating Bangladesh by 10 wickets in the 1st Test and by 296 runs in the 2nd Test respectively. Bangladesh finally emerged victorious during the Zimbabwe tour in Bangladesh whitewashing the visitors 3–0 during the Test series. Bangladesh claimed No. 9 ranking with the series victory pushing Zimbabwe to No. 10. In the ODI series, Bangladesh whitewashed Zimbabwe 5–0. At the turn of the new year, Bangladeshi all-rounder Shakib Al Hasan emerged as the number one all-rounder in all formats of the game. This was the first time that any player ever achieved such a feat, after the ICC introduced ranking system. During the group stage of the 2015 Cricket World Cup, Bangladesh defeated Afghanistan in their first game, and their next match against Australia was Washed Out. They lost their next game to Sri Lanka by 92 runs. Following that, they achieved their highest successful run-chase in an ODI, when they chased down Scotland's 318, and later qualified for the second quarterfinal in the 2015 world cup, by defeating England. At the second quarter-final, India comprehensively defeated Bangladesh by 109 runs, knocking them out of the 2015 World Cup. After a successful world cup campaign, reaching the quarter final for the first time, the whole team was given a grand reception at the Airport on 22 March. Mahmudullah Riyad became the first player to score a century for Bangladesh in a World Cup match. Mahmudullah Riyad and Mushfiqur Rahim's partnership of 141 was the highest partnership for any wicket for Bangladesh in a World Cup match. It was also Bangladesh's highest ODI partnership against England. This was also Bangladesh's highest score in an ODI against England. Bangladesh and Sri Lanka qualified for the quarter-finals as a result of this match. This was only the second time that Bangladesh had progressed past the World Cup Group stages and it is their first appearance in a knockout stage of a World Cup. England was eliminated from the World Cup as a result of this match. Bangladesh captain Mashrafe Mortaza was fined 40% of his match fee for a slow over rate. The other Bangladesh players were fined 20% of their match fee. In April–May 2015 Pakistan was in Bangladesh for a full series. Bangladesh won the ODI series 3–0 recording their first series victory over Pakistanis. The only T20I was also won by Bangladesh. However Pakistan claimed the Test series victory (1–0), by drawing the first test and winning the second test by 328 runs. A full strength Indian team arrived in Bangladesh in June 2015, for an one-off Test and 3 ODIs, where the Indians were expected to win comfortably. During the Test, the Indian team was too strong for Bangladesh where they were enforced to follow on. But the heavy rain interruptions denied a decisive result (only 184.2 overs were played). However excellent performances by the batsmen and ODI debutant bowler Mustafizur Rahman had the tables turned over as Bangladesh convincingly won the first two ODIs and for the first time, won a bilateral series against India by a margin of 2–1. During July 2015 South Africa visited Bangladesh for 2 T20Is, 3 ODIs and 2 Tests. South Africa whitewashed Bangladesh in the T20I series (2–0) and took the lead of ODI series winning the first match. However Bangladesh came back strongly and completely dominated South Africa in the following two matches, showing excellent performance in all three departments where none of the team in any match could reach 200 runs in an innings in the whole ODI series, to win the series by a margin of 2–1, which marked the first series win ever against South Africa. Two match test series was shared (0–0) after heavy monsoon rains curtailed both games (played 221 and 88.1 overs respectively). Strong performances shown by Bangladesh in ODIs since the ICC Cricket World Cup 2015, winning ODI series against Pakistan, India and South Africa, helped it jump from ninth to seventh in the ODI Team Rankings. Since they were ranked No. 7 in ODIs on 30 September 2015 which was the cut-off date, they have qualified for the 2017 ICC Champions Trophy replacing West Indies. In November 2015, The Zimbabwean cricket team toured in Bangladesh. The tour consisted of three One Day Internationals (ODIs), two Twenty20 Internationals (T20Is). Bangladesh won the ODI series 3–0 and shared the T20I series 1–1. Zimbabwe toured Bangladesh for another T20I series consisting of 4 games in January 2016. Again the series was shared 2–2. The golden run continued to Bangladesh when they became runner up of 2016 Asia Cup, played on home soil. They lost the first match at group stage to India. Then they won against UAE, Sri Lanka (reigning World T20 champions and Asian champions) and Pakistan consecutively to reach the Asia Cup final for the second time. However they were again comprehensively beaten by India in the final. However Bangladesh did not have a significant success during the 2016 ICC World Twenty20 held in India in March–April 2016. Wins against two associates (Netherlands and Oman) and the washed out game against another associate (Ireland) at the group stage saw them reach the Super 10. They returned home losing all four games at the Super 10 stage against full members Pakistan, Australia, India and New Zealand. Bangladesh emerged victorious in another home ODI series (2–1) against Afghanistan in Sep–Oct 2016. This was followed by the England tour of Bangladesh, where Bangladesh lost the ODI leg by 2–1. But they secured a historic Test win (by 108-runs) against England, their first win in 10 attempts, and sharing the two-match test series 1–1, after losing the first test narrowly by 22-runs. First Test match win for Bangladesh against England. Bangladesh toured New Zealand for a complete series in December 2016. Bangladesh started the tour with a 3–0 whitewash defeat in ODI series and the dawn of new year 2017 saw a similar 3–0 whitewash defeat in T20I series. With that, Bangladesh is yet to win a T20I against New Zealand. Further, Bangladesh lost the Test series 2–0. However they broke the 123 years old record for the Highest first innings total in tests to lose during the 1st Test vs New Zealand by scoring 595/8 dec. They finished the tour losing all the games 8–0. Then Bangladesh toured India in February 2017 for the historical first Test match between two countries on Indian soil. India won the game comprehensively by 208 runs, having declared in both innings. The next assignment for Bangladesh was another full away tour in Sri Lanka in March–April 2017. Bangladesh were comprehensively beaten by 259 runs in the first Test. However they were able draw the Test series 1–1, by winning the second test by four-wicket. That meant Bangladesh won their 100th Test match becoming one of the four teams to achieve that feat. Further this was Bangladesh's first test match victory against Sri Lanka. First Test match win for Bangladesh against Sri Lanka. This was the 100th Test match for Bangladesh. Bangladesh led the ODI series after two games 1–0, since winning the first ODI by 90 runs and the second ODI being washed away by rain. However Sri Lanka won the third ODI by 70 runs, levelling the ODI series 1–1. The T20I series was also shared 1–1. In May 2017, Bangladesh finished second at the Ireland Tri-Nation ODI Series held in Ireland, winning 2 (vs New Zealand and Ireland), losing 1 (vs New Zealand) and 1 washed out (vs Ireland) games. Bangladesh started the 2017 ICC Champions Trophy campaign with a defeat in the series opener against England. However a washout against Australia and a win help them to reach the semi-finals for the first time in Bangladesh cricket history. Finally they were knocked out of the tournament after a huge loss to India by 9 wickets in the semi-finals. Australia toured Bangladesh in August–September 2017 for a two match Test series. Host Bangladesh registered their first test match win ever over Australia when they defeated the touring team by 20 runs during the first Test. First Test match win for Bangladesh against Australia. However Bangladesh was unable to secure the series victory, since Australia won the second Test by 7 wickets and the series was shared 1–1. In September–October 2017 Bangladesh toured South Africa to play 2 Tests, 3 ODIs and 2 T20Is where Bangladesh was whitewashed 0–7 across formats. Team South Africa was too strong for Bangladesh and these games were extremely one-sided, creating several new team and personal records. Bangladesh lost two test by 333 runs and by an innings and 254 runs respectively. The latter being the biggest Test win ever for South Africa. South Africa won the 1st ODI by 10 wickets which registered the highest target (279) chased down without losing a wicket in ODIs. In last two ODIs Bangladesh lost comprehensively by 104 and by 200 runs. Later Bangladesh also lost the 2 T20Is by 20 runs and 83 runs. During the 2nd T20I David Miller scored the fastest T20I century ever recorded. However, during the middle of this tour Bangladesh was qualified for the 2019 Cricket World Cup since they were at No. 7 of ICC ODI rankings by 30 September 2017 cut-off date. On 9 November 2017, BCB president Nazmul Hassan announced that Hathurusingha submitted resignation from the post of Bangladesh head coach during the team's tour of South Africa. During his tenure, Bangladesh won 6 Tests (in 21), 25 ODIs (in 52) and 10 T20Is (in 29) which is arguably the most successful era of Bangladesh Cricket. Further, under his wings Bangladesh reached quarter finals of 2015 Cricket World Cup, qualified and later reached semi-finals of 2017 ICC Champions Trophy, qualified for 2019 Cricket World Cup, became runner up of 2016 Asia Cup, defeated India, Pakistan and South Africa in home bilateral series, climbed up to No. 6 of ODI rankings, registered their first Test wins against England, Sri Lanka and Australia. He was instrumental in Bangladesh beginning to actively picking more pace bowlers in their attack. Shakib Al Hasan has replaced Mushfiqur Rahim as Bangladesh's Test captain, starting with the upcoming Sri Lanka tour in January 2018. Mahmudullah will take over the vice-captaincy from Tamim Iqbal while the BCB is yet to announce a new coach. BCB chairman announced that their assistant coach Richard Halsall, will be in charge of coaching the side ahead of the Tri-nation ODI series held in January 2018 at home. Convincing wins against low ranked opponents, Sri Lanka and Zimbabwe, in the first three group games saw Bangladesh reach the finals. Bangladesh recorded their biggest win in ODI cricket (won by 163 runs) against Sri Lanka during the process. However Bangladesh were bowled out for 82 (which was their ninth-lowest ODI total) and lost by 10 wickets in the last group game against Sri Lanka. They met Sri Lanka in the finals and lost the match by 79 runs, extending their win-less run in tournament finals. The 1st Test against Sri Lanka was a high scoring draw. Later, Bangladesh lost the 2nd Test by 215 runs inside 3 days, conceding the Test series 1–0. Bangladesh also lost the T20I series 3–0. Courtney Walsh acted as the interim coach for 2018 Nidahas Trophy, a triangular T20I series held in Sri Lanka in March. Bangladesh lost the tournament final against India, after reaching there defeating Sri Lanka twice in group matches. On 1 May, Bangladesh broke into the top eight of the Test rankings for the first time, as a result of the ICC's annual update to the rankings. Bangladesh got whitewashed in a 3 match T20I series against Afghanistan in India, losing their matches by 45 runs, by 6 wickets and by 1 run respectively. This recorded Bangladesh's first T20I match loss ever and their first T20I series loss against Afghans as well. BCB appointed former England wicketkeeper Steve Rhodes the Bangladesh head coach for all three formats in early March ahead of West Indies tour. Bangladesh hit an all-time low when they were dismissed for 43 (their lowest score in Tests) during the 1st Test against West Indies at North Sound and eventually lost the test by an innings and 219 runs. Later Bangladesh lost the 2nd Test by 166 runs and lost the series 2–0. Later they performed well in limited overs formats and eventually ended up the tour by winning the three match ODI and T20I series by 2–1 margin each. Bangladesh started their Asia Cup 2018 campaign with a win over Sri Lanka by 137 runs, which was their biggest win, by runs in ODIs away from home. Even-though they faced a heavy loss in their next match at group stage against Afghanistan, (lost by 136 runs – Bangladesh's biggest lost, by runs in ODIs against Afghanistan), they have progressed to the Super Four stage. Bangladesh lost to India by 7 wickets, narrowly won against Afghanistan by 3 runs and defeated Pakistan by 37 runs at the Super Four stage to reach the Final of the Asia Cup. At the Final, they have lost to India by 3 wickets, extending their win-less record in tournament Finals. In October–November, Bangladesh hosted a three match ODI and two match test series against Zimbabwe. Bangladesh won the ODI series 3–0 while they drew the test series 1–1, losing the first test of the series at Sylhet which was the inaugural test of the venue. West Indies toured Bangladesh for a full series in November–December. Bangladesh won the 2 match test series 2–0. By defeating West Indies in the 2nd test by an innings and 184 runs, Bangladesh recorded their first innings victory in Test cricket. Bangladesh also won the 3 match ODI series by 2–1 margin. But lost the T20I series by 2–1 margin. Bangladesh enforced the follow-on for the first time in Tests. Mehedi Hasan took the best match figures by a Bangladesh bowler in Tests (12/117). This was Bangladesh's biggest winning margin by runs, and their first win by an innings in Tests. Bangladesh toured New Zealand in February–March 2019. Bangladesh got whitewashed in the 3 match ODI series. Bangladesh lost the first Test at Hamilton by an innings and 52 runs. Later they have lost the second Test at Wellington by an innings and 12 runs even after the first two days play were abandoned due to rain. The third test was cancelled following the Christchurch mosque shootings, which the team narrowly escaped. The Bangladesh Cricket Board (BCB) is the governing body for the Bangladeshi cricket team and the sport in the country. The BCB is responsible for maintaining grounds and promoting the sport. It was founded in 1972 as the Bangladesh Cricket Control Board. Its first constitution was drafted in 1976. The board changed its name, dropping "control" from its title, in January 2007. The president of the BCB is appointed by the government of Bangladesh. The board also controls the team's sponsorship. Since 2003 telecommunications company Grameenphone has sponsored the men and women's national teams. Between 2007 and 2011 they invested ৳151.5 million (US$1.9 million) in developing sport in the country. In 2006 the Board established an academy to encourage the development of young and inexperienced players. The Board issues central contracts to the national players and issuing match fees. In 2005 players were given about $1,000 for each Test they played and $500 per ODI. Bangladesh playing against Zimbabwe in 2009. Fans can be seen in the background waving a Bangladesh flag. Before Bangladesh had even secured Test status, cricket fans in the country took the game seriously; when the team lost an ODI against Kenya in March 1999, several hundred fans protested outside the offices of the Bangladesh Cricket Board (BCB). On learning of Bangladesh's promotion to Test status, thousands of people celebrated on the streets. Then Prime Minister Sheikh Hasina remarked that "I can't express my joy in words at this happiest hour of the nation". At the time cricket was the second-most popular sport in the country behind football. When Bangladesh began its first Test match on 10 November 2000 at Bangabandhu National Stadium in Dhaka, the stadium was nearly full on the first day as around 40,000 people watched the team take on India. As the match partly overlapped with the festival of Shab-e-Barat, numbers attending declined as the match progressed. In 2011, Bangladeshi politician Saber Hossain Chowdhury opined that "In Bangladesh cricket is not simply a game, it is a symbol of national unity", and in the words of AHM Mostofa Kamal, president of the BCB in 2011, "People of Bangladesh take cricket religiously". The people of Bangladesh are referred as "the most passionate cricket fans" among the cricket world. When Bangladesh are victorious, the fans sometimes take to the streets in celebration. When Bangladesh defeated India in the 2007 World Cup, thousands of people celebrated into the night on the streets of Dhaka despite there being a ban on public gatherings at the time. Although fans are jubilant in victory, they can also be vocal in defeat. When Bangladesh lost to England in an ODI in November 2003, the then captain Khaled Mahmud was booed off the field. During the 2011 World Cup, Bangladesh succumbed to a record defeat against West Indies, registering the team's lowest score in ODIs. The buses of both teams were stoned (Bangladesh's intentionally, West Indies' mistakenly), as was Shakib Al Hasan's house. In test cricket, Bangladesh wears cricket whites, with the BCB logo on the left chest and the PRAN Frooto logo on the right chest. Fielders wear a dark green cap or a white wide brim sunhat. The helmets are also dark green. In limited overs cricket, Bangladesh wears a green uniform with red being the secondary colour and the BCB logo on chest and the Pran Frooto logo on the center and "BANGLADESH" written underneath in red letters. with the fielders wearing a green baseball cap with red accents or a green wide-brimmed hat. During ICC tournaments, the PRAN Frooto logo is placed on the left sleeve. In the 1999 Cricket World Cup, Bangladesh wore an olive green uniform with yellow accents and an horizontal stripe with tigerstripe motif on the chest. Uniliver Bangladesh on 6 September 2018 became the National cricket team, Women cricket team, Under-19 team sponsor for the period of 2018 to 2020. In April 2018 BCB took a new decision to decrease players from central contract and thus removed 6 player from contract. In February 2019 BCB announced the name of 18 players for central contract. The BCB has changed the gradation of the salary slabs, making it only A+, A, B and rookie this year and Grade C and D has been dissolved. In addition to this, the captain will earn a responsibility bonus of ৳20,000 (US$260) per match. [US$1 = 80 taka, 1 million = 1 million]. Players who are in the playing XI get paid ৳3 lakh (US$3,800) for each test while they are paid ৳2 lakh (US$2,600) for each ODI and ৳1.25 lakh (US$1,600) for each T20I. renamed as "ICC T20 World Cup" from 2020. Last updated 12 March 2019. Players listed in bold are still playing. Records complete to Test # 2350. Last updated 12 March 2019. Records complete to ODI # 4095. Last updated 20 February 2019. Records complete to T20I # 717. Last updated 22 December 2018. Most consecutive Test defeats 21 (2001–2004). Most consecutive Test series defeats 16 (2000/01-2004/05). Most consecutive ODI defeats 23 (1999–2002). Most consecutive ODIs without victory 47 (1999–2003). Only Test side which have lost the first ODI they have played against five non-Test sides (Canada 2003, Kenya 2003, Ireland 2007, Netherlands 2010 and Afghanistan 2014). The highest innings total in a losing cause 595/8 dec vs New Zealand in 2017. Bangladesh has taken 16 years and 12 days—the least amount of time among all 10 Test-playing countries—to reach the landmark figure of playing 100 tests. Bangladesh is the only test team having not been involved in any tied international matches. Aminul Islam became world's third cricketer to score his maiden century on country's inaugural test in 2000 against India. He achieved this feat after Charles Bannerman (Australia) and Dave Houghton (Zimbabwe) while Irish cricketer Kevin O'Brien was the latest and the fourth member to join this elite club. Mohammad Ashraful holds the record for the youngest cricketer to make a Test century. He was 17 years and 61 days old when he made 114 against Sri Lanka at Colombo on 8 September 2001, during his Test debut. In 2005 against Zimbabwe, Enamul Haque Jr. became the youngest bowler ever to take a 10 wicket-haul in test at the age of 18 years 40 days. Mashrafe Mortaza was the leading wicket-taker in ODIs in 2006, with 49 wickets in 27 matches. On 21 November 2012, Abul Hasan became only the second Test cricketer in history to make a century at number 10 on debut, against the West Indies at Khulna. On 13 October 2013, against New Zealand at Chittagong, Sohag Gazi became the first cricketer ever to score a century and take a hat-trick in the same Test match. In 2014, Shakib Al Hasan became only third cricketer after Ian Botham (England) and Imran Khan (Pakistan) to score a century and to pick up 10 wickets in same test. Taijul Islam became the first bowler ever to take a hat-trick on debut in an ODI against Zimbabwe at Dhaka on 1 December 2014. Shakib Al Hasan became the first player in history to hold the number 1 positions in all three formats of cricket, in the all-rounder category on 12 January 2015. Mustafizur Rahman became the first cricketer ever to take 11 wickets in his first two ODIs when he took 5/50 against India on 18 June 2015 and then 6/43 against the same team three days later. Both matches were played at Dhaka. Until 25 July 2015, Elias Sunny was the only player to be nominated as the Man of the match in two formats of the international cricket as a debutant. He made it in Test(v West Indies in 2011) & T20I(v Ireland in 2012). Mustafizur Rahman, being only second to Elias Sunny, did it in ODI(v India) and in Test(v South Africa) both in 2015. On 7 June 2018 in the 3rd T20I against Afghanistan by taking the wicket of Najibullah Zadran, Shakib Al Hasan became the quickest All-rounder to achieve the double of 10,000 runs and 500 wickets in 302 international matches and became only 3rd cricketer to do so following Jacques Kallis and Shahid Afridi. ^ "Bangladesh to play extra T20 in Netherlands". ESPNcricinfo. Retrieved 6 January 2017. ^ "Bangladesh to play 100th Test in March". ESPNcricinfo. Retrieved 17 February 2017. ^ "Statsguru – Bangladesh – ODI matches – Team analysis". ESPNcricinfo. Retrieved 24 May 2017. ^ "Statsguru – Bangladesh – T20I matches – Team analysis". ESPNcricinfo. Retrieved 6 April 2017. ^ "ICC rankings – ICC Test, ODI and Twenty20 rankings". ESPNcricinfo. Retrieved 21 May 2017. ^ "Former BCB general secretary dies in Dhaka". ESPNcricinfo. Retrieved 16 January 2016. ^ "When Bangladesh strode onto the Test stage". ^ "Bangladesh v West Indies". ^ "Bangladesh v Sri Lanka, 2005–06". 17 April 2007. ^ "Bangladesh v Zimbabwe, 2006–07". 18 April 2007. ^ "Whatmore quits as Bangladesh coach". ^ "Ashraful named Bangladesh captain". ESPNcricinfo. 2 June 2007. Retrieved 4 December 2008. ^ "Ashraful named Bangladesh captain". ^ "Bangladesh tour of Sri Lanka". ESPNcricinfo. ^ "Results – Global – ESPN Cricinfo". ESPNcricinfo. ^ "Bangladesh tour of New Zealand". ESPNcricinfo. ^ "South Africa tour of Bangladesh". ESPNcricinfo. ^ "Ireland tour of Bangladesh". ESPNcricinfo. ^ "Bangladesh tour of Pakistan". ESPNcricinfo. ^ "Points Table – Kitply Cup 2008 – ESPN Cricinfo". ESPNcricinfo. ^ "Points Table – Asia Cup – ESPN Cricinfo". ESPNcricinfo. ^ "Bangladesh tour of Australia". ESPNcricinfo. ^ "Bangladesh tour of South Africa". ESPNcricinfo. ^ "Brave Bangladesh fall 107 short". ^ "Sri Lanka tour of Bangladesh". ESPNcricinfo. ^ "Murali cameo clinches humdinger". ^ "Zimbabwe tour of Bangladesh". ESPNcricinfo. ^ "Points Table – ICC World Twenty20 2009 – ESPN Cricinfo". ESPNcricinfo. ^ "Mortaza named Bangladesh captain". ESPNcricinfo. Retrieved 9 March 2016. ^ "The origins of the issue". ESPNcricinfo. Retrieved 21 July 2009. ^ "Scorecard: West Indies v Bangladesh, 1st Test, 9–13 July 2009". ESPNcricinfo. Retrieved 21 July 2009. ^ "Scorecard: West Indies v Bangladesh, 2nd Test, 17–20 July 2009". ESPNcricinfo. Retrieved 21 July 2009. ^ Veera, Sriram. "Raqibul and Shakib inspire first overseas series win". ESPNcricinfo. Retrieved 21 July 2009. ^ "Sports Minister congratulates Bangladesh cricket team". The New Nation. Retrieved 27 July 2009. ^ "Bangladesh tour of Zimbabwe". ESPNcricinfo. ^ "Al Hasan named Wisden's top Test player". ^ "Tri-Nation Tournament in Bangladesh Table – 2010". ESPNcricinfo. ^ "India tour of Bangladesh". ESPNcricinfo. ^ "England tour of Bangladesh". ESPNcricinfo. ^ a b c "Bangladesh tour of England, Ireland and Scotland". ESPNcricinfo. ^ "Live cricket scores, commentary, match coverage – Cricket news, statistics – ESPN Cricinfo". ESPNcricinfo. Retrieved 9 March 2016. ^ "New Zealand tour of Bangladesh". ESPNcricinfo. ^ "Australia tour of Bangladesh". ESPNcricinfo. ^ "Team records – Combined Test, ODI and T20I records – Cricinfo Statsguru – ESPN Cricinfo". ^ "Pakistan tour of Bangladesh". ESPNcricinfo. ^ Association, Press (30 May 2012). "Bangladesh appoint Richard Pybus as new head coach on two-year deal". The Guardian. ^ "Bangladesh tour of Ireland and Netherlands". ESPNcricinfo. ^ "Points Table – ICC World Twenty20 2012 – ESPN Cricinfo". ESPNcricinfo. ^ "Pybus to quit as Bangladesh coach". ^ "Jurgensen is interim Bangladesh coach". ^ "West Indies tour of Bangladesh". ESPNcricinfo. ^ "Shane Jurgensen becomes full-time Bangladesh coach – Cricket – ESPN Cricinfo". ESPNcricinfo. Retrieved 9 March 2016. ^ "1st Test: Sri Lanka v Bangladesh at Galle, Mar 8–12, 2013 – Cricket Scorecard – ESPN Cricinfo". ESPNcricinfo. Retrieved 9 March 2016. ^ "Sri Lanka in Bangladesh Test Series". ESPNcricinfo. ^ "Sri Lanka in Bangladesh T20I Series". ESPNcricinfo. ^ "Sri Lanka in Bangladesh ODI Series". ESPNcricinfo. ^ "Points Table – World T20 – ESPN Cricinfo". ESPNcricinfo. ^ "Shane Jurgensen resigns as Bangladesh coach – Cricket – ESPN Cricinfo". ESPNcricinfo. Retrieved 9 March 2016. ^ "Hathurusingha named Bangladesh coach". ESPNcricinfo. Retrieved 9 March 2016. ^ "Bangladesh tour of West Indies". ESPNcricinfo. ^ a b "Shakib Al Hasan tops ICC all-rounder rankings in all three formats". NewsComAu. 14 January 2015. Retrieved 9 March 2016. ^ "7th match, Pool A (D/N), ICC Cricket World Cup at Canberra, Feb 18 2015 – Match Summary". ESPNcricinfo. ^ "11th Match, Pool A (D/N), ICC Cricket World Cup at Brisbane, Feb 21 2015 – Match Summary". ESPNcricinfo. ^ "18th Match, Pool A (D/N), ICC Cricket World Cup at Melbourne, Feb 26 2015 – Match Summary". ESPNcricinfo. ^ "27th Match, Pool A, ICC Cricket World Cup at Nelson, Mar 5 2015 – Match Summary". ESPNcricinfo. ^ "33rd Match, Pool A (D/N), ICC Cricket World Cup at Adelaide, Mar 9 2015 – Match Summary". ESPNcricinfo. ^ "2nd quarter-Final (D/N), ICC Cricket World Cup at Melbourne, Mar 19 2015 – Match Summary". ESPNcricinfo. ^ Habib, Haroon (22 March 2015). "Rousing welcome for Bangladesh WC team". The Hindu. ^ a b "Mahmudullah ton lifts Bangladesh to 275". ESPNcricinfo. 9 March 2015. Retrieved 9 March 2015. ^ "Records tumble for Bangladesh". ESPNcricinfo. 9 March 2015. Retrieved 9 March 2015. ^ "2015 Cricket World Cup pools and venues revealed". Herald Sun. 30 July 2013. Retrieved 3 March 2014. ^ a b "Cricket World Cup 2015: England knocked out by Bangladesh". BBC Sport. 9 March 2015. Retrieved 9 March 2015. ^ "World Cup 2015: Bangladesh Fined for Slow Over-Rate in Win Over England". NDTV. 9 March 2015. Retrieved 2 April 2015. ^ "Bangladesh seal series with nine-wicket win". ESPNcricinfo. Retrieved 7 March 2016. ^ "1st Test, South Africa tour of Bangladesh at Chittagong, Jul 21–25 2015 – Match Report". ESPNcricinfo. ^ "2nd Test, South Africa tour of Bangladesh at Dhaka, Jul 30 – Aug 3 2015 – Match Report". ESPNcricinfo. ^ "Teams confirmed for ICC Champions Trophy 2017". ^ "Zimbabwe tour of Bangladesh [Jan 2016]". ESPNcricinfo. ^ "Final (N), Asia Cup at Dhaka, Mar 6 2016 – Match Summary". ESPNcricinfo. ^ "Afghanistan tour of Bangladesh 2016/17 Scores, Fixtures, Tables & News". ESPNcricinfo. ^ "England tour of Bangladesh 2016/17 Scores, Fixtures, Tables & News". ESPNcricinfo. ^ "Cook rues lack of 'world-class' spin as Bangladesh seal historic win". ESPNcricinfo. Retrieved 30 October 2016. ^ "Bangladesh tour of New Zealand 2016/17 Scores, Fixtures, Tables & News". ESPNcricinfo. ^ "Bangladesh's 595: the highest total in a losing cause". ESPNcricinfo. Retrieved 23 January 2017. ^ "Only Test, Bangladesh tour of India at Hyderabad, Feb 9–13 2017 – Match Summary". ESPNcricinfo. ^ "Sixteen years, 18 tries, one win". ^ "Bangladesh tour of Sri Lanka 2016/17 Scores, Fixtures, Tables & News". ESPNcricinfo. ^ "Ireland Tri-Nation Series Table – 2017". ESPNcricinfo. ^ "ICC Champions Trophy (ICC KnockOut) Table – 2017". ESPNcricinfo. ^ "2nd Semi-final, ICC Champions Trophy at Birmingham, Jun 15 2017 – Match Summary". ESPNcricinfo. ^ "1st Test, Australia tour of Bangladesh at Dhaka, Aug 27–30 2017 – Match Summary". ESPNcricinfo. ^ "Australia tour of Bangladesh 2017 Scores, Fixtures, Tables & News". ESPNcricinfo. ^ "Bangladesh tour of South Africa 2017/18 Scores, Fixtures, Tables & News". ESPNcricinfo. ^ "Rabada on the rise". ^ "Miller smashes record for fastest T20I ton". ^ "Sri Lanka qualify for ICC Cricket World Cup 2019". ^ "Hathurusingha submitted resignation during SA tour – BCB president". ^ "Uncertainty over Hathurusingha's future as Bangladesh coach". ^ "How Bangladesh came to have a pace-heavy ODI attack". ^ "Shakib named new Bangladesh Test captain". ^ "Bangladesh without head coach for Zimbabwe, Sri Lanka tri-series". ^ "Walsh named Bangladesh's interim head coach". ^ "Nidahas Twenty20 Tri-Series 2018 Scores, Fixtures, Tables & News". ESPNcricinfo. ^ "India widen gap at the top of Test rankings". ^ "Advantage Afghanistan in spin-friendly Dehradun". ESPNcricinfo. Retrieved 3 June 2018. ^ "BCB appionted Steve Rhodes as Head coach". ESPNcricinfo. ^ "Lowest toal by Bangladesh in test". ESPNcricinfo. ^ "Bangaldesh won first T20I series outside Asia since 2012". Cricbuzz. ^ "Bangladesh rout Windies for 111, enforce follow-on". SuperSport. Retrieved 2 December 2018. ^ "Mehidy Hasan tears through West Indies as Bangladesh wrap up Test series in style". The National. Retrieved 2 December 2018. ^ "Mehidy 12-for scripts record Bangladesh win". ESPNcricinfo. Retrieved 2 December 2018. ^ "Khan Shaheb Osman Ali Stadium Test matches". ESPNcricinfo. Retrieved 20 November 2012. ^ "Khan Shaheb Osman Ali Stadium ODI matches". ESPNcricinfo. Retrieved 20 November 2012. ^ "Khan Shaheb Osman Ali Stadium T20I matches". ESPNcricinfo. Retrieved 20 November 2012. ^ "Sheikh Abu Naser Stadium Test matches". ESPNcricinfo. Retrieved 20 November 2012. ^ "Sheikh Abu Naser Stadium ODI matches". ESPNcricinfo. Retrieved 20 November 2012. ^ "Sheikh Abu Naser Stadium T20I matches". ESPNcricinfo. Retrieved 20 November 2012. ^ "Sher-e-Bangla Stadium Test matches". ESPNcricinfo. Retrieved 20 November 2012. ^ "Sher-e-Bangla Stadium ODI matches". ESPNcricinfo. Retrieved 20 November 2012. ^ "Sher-e-Bangla Stadium T20I matches". ESPNcricinfo. Retrieved 20 November 2012. ^ "ZAC Stadium Test matches". ESPNcricinfo. Retrieved 20 November 2012. ^ "ZAC Stadium ODI matches". ESPNcricinfo. Retrieved 20 November 2012. ^ "ZAC Stadium T20I matches". ESPNcricinfo. Retrieved 20 November 2012. ^ "Sylhet Stadium Test matches". ESPNcricinfo. Retrieved 4 November 2018. ^ "Sylhet Stadium T20I matches". ESPNcricinfo. Retrieved 20 November 2012. ^ "Bangabandhu Stadium Test matches". ESPNcricinfo. Retrieved 20 November 2012. ^ "Bangabandhu Stadium ODI matches". ESPNcricinfo. Retrieved 20 November 2012. ^ "M. A. Aziz Stadium Test matches". ESPNcricinfo. Retrieved 20 November 2012. ^ "M. A. Aziz Stadium ODI matches". ESPNcricinfo. Retrieved 20 November 2012. ^ "Shaheed Chandu Stadium Test matches". ESPNcricinfo. Retrieved 20 November 2012. ^ "Shaheed Chandu Stadium ODI matches". ESPNcricinfo. Retrieved 20 November 2012. ^ "Venues and Matches hosted by Bangladeshi cricket venues". ^ "Classic World Cup Kits – 1999". Retrieved 11 September 2018. ^ "Bowled over by Veetee? (19 May 1999)". ESPNcricinfo. Retrieved 11 September 2018. ^ "BCCSL appoints AJ Sports as official clothing sponsor". ESPNcricinfo. Retrieved 11 September 2018. ^ "Ihsan Sports to sponsor Bangladesh's five teams including the national cricket team". Retrieved 11 September 2018. ^ "Bangladesh strike deal with GrameenPhone". ESPNcricinfo. Retrieved 11 September 2018. ^ "Bata clothing sponsors for cricket teams". The Daily Star. 3 April 2009. Retrieved 11 September 2018. ^ Editorial, Reuters. "Cricket-Sahara Group set to become Bangladesh cricket sponsor". U.K. Retrieved 11 September 2018. ^ "Pran to sponsor Bangladesh for Pakistan series after Top of Mind sells rights". Retrieved 11 September 2018. ^ "Robi retains sponsorship right of Bangladesh cricket team". Retrieved 11 September 2018. ^ "Unilever to sponsor Bangladesh cricket team till 2020". BDCricTime. 6 September 2018. Retrieved 20 November 2018. ^ "Imrul Kayes, Mohammad Saifuddin handed central contracts". ESPNCricinfo. Retrieved 3 February 2019. ^ "ক্রিকেটাররা কে কোন ক্যাটাগরিতে, কার কত বেতন". Prothom Alo. Retrieved 3 February 2019. ^ "Steve Rhodes takes over as Bangladesh coach". ESPNcricinfo. Retrieved 7 June 2018. ^ "Ryan Cook named Bangladesh fielding consultant". ^ "Kirsten will be working as a team management consultant". ^ a b "Records / Bangladesh / Test matches / Result summary". ESPNcricinfo. Retrieved 16 June 2017. ^ a b "Records / Bangladesh / One-Day Internationals / Result summary". ESPNcricinfo. Retrieved 16 June 2017. ^ a b "Records / Bangladesh / Twenty20 Internationals / Result summary". ESPNcricinfo. Retrieved 16 June 2017. ^ "Records / Bangladesh / Test matches / Most runs". ESPNcricinfo. Retrieved 19 March 2017. ^ "Records / Bangladesh / Test matches / Most wickets". ESPNcricinfo. Retrieved 19 March 2017. ^ "Records / Bangladesh / One-Day Internationals / Most runs". ESPNcricinfo. Retrieved 24 May 2017. ^ "Records / Bangladesh / One-Day Internationals / Most wickets". ESPNcricinfo. Retrieved 16 June 2017. ^ "Records / Bangladesh / Twenty20 Internationals / Most runs". ESPNcricinfo. Retrieved 6 April 2017. ^ "Records / Bangladesh / Twenty20 Internationals / Most wickets". ESPNcricinfo. Retrieved 6 April 2017. ^ "Records / Test matches / Team records / Most consecutive defeats". ESPNcricinfo. Retrieved 20 July 2015. ^ "Records / Test matches / Team records / Most consecutive series defeats". ESPNcricinfo. Retrieved 20 July 2015. ^ "Records / One-Day Internationals / Team records / Most consecutive defeats". ESPNcricinfo. Retrieved 20 July 2015. ^ "Records / One-Day Internationals / Team records / Most consecutive matches without victory". ESPNcricinfo. Retrieved 20 July 2015. ^ "Bangladesh's first-encounter". ESPNcricinfo. Retrieved 1 March 2014. ^ "Youngest Test side Bangladesh cricket team set for century milestone". Hindustan Times. Retrieved 19 March 2017. ^ "Records / 2006 / One-Day Internationals / Most wickets". ESPNcricinfo. Retrieved 11 July 2015. ^ "Duff peer: Bangladesh cricketer equals 110-year-old Test record". The Sydney Morning Herald. 22 November 2012. Retrieved 26 November 2014. ^ "Gazi shines as Test ends in draw". ESPNcricinfo. 13 October 2013. Retrieved 13 December 2014. ^ "Taijul debut hat-trick seals 5–0 win". ESPNcricinfo. 1 December 2014. Retrieved 1 December 2014. ^ "Prothom Alo". Prothom Alo. Retrieved 9 March 2016. ^ "Mustafizur's record-breaking ODI genesis". ESPNcricinfo. 21 June 2015. Retrieved 22 June 2015. ^ "Test debutant Sunny became Player of the match". ESPNcricinfo. 25 October 2011. Retrieved 26 October 2011. ^ "T20I debutant Sunny became Player of the match". ESPNcricinfo. 18 July 2012. Retrieved 19 July 2012. ^ "মুস্তাফিজের অনন্য ইতিহাস". bdnews24.com. 25 July 2015. Retrieved 26 July 2015. ^ "Shakib became the quickest All-rounder to achieve the double of 10000 runs & 500 wickets". Wikimedia Commons has media related to Bangladesh national cricket team.